FCC Votes To Begin Rollback Of Net Neutrality Regulations : The Two-Way The vote begins a months-long process to collect — once again — public comment on how the government should regulate Internet service providers. The FCC is repealing Obama-era rules. The Federal Communications Commission has officially begun to undo Obama-era regulations on Internet service providers, often called net neutrality rules. The rules, passed in 2015, had placed cable and telecom companies under the strictest-ever oversight of the agency. 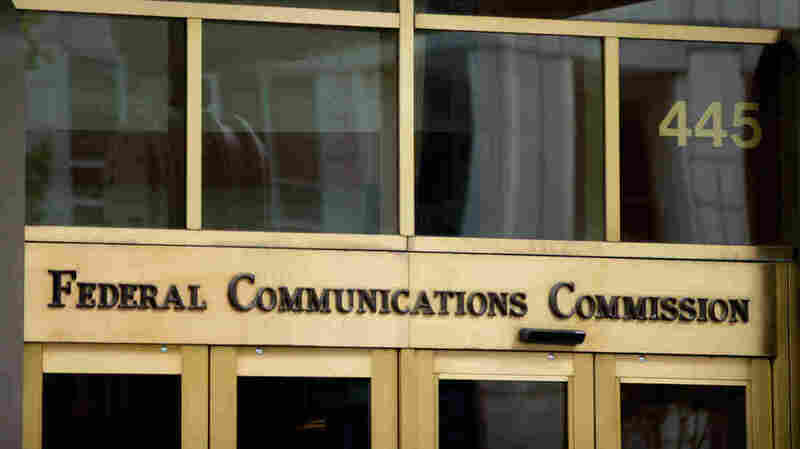 In a 2-1 vote along party lines Thursday, the FCC's Republicans voted to propose a new review of the rules, with the goal of loosening the regulations on the industry. As dozens of protesters outside urged the agency to stop the proceeding and keep the strict oversight, FCC Chairman Ajit Pai argued that the current rules represented a "bureaucratic straitjacket" on the industry. "The Internet was not broken in 2015," Pai said, repeating his often-chosen turn of phrase. "The utility-style regulations known as Title II were and are like the proverbial sledgehammer being wielded against the flea. Except that here, there was no flea." The term net neutrality has come to encapsulate the idea that Internet providers such as Comcast or Verizon should treat all web traffic equally and fairly. This means they can't block access to any websites or apps, and can't meddle with loading speeds. The 2015 rules also included a ban on so-called paid prioritization: the idea that Internet providers shouldn't give special treatment to apps and websites that pay extra. The FCC's new proposal — titled "Restoring Internet Freedom" — considers not only whether to undo the legal approach that enforced those rules, but also whether the rules were warranted in the first place. As Pai puts it, the proposal would "return to the Clinton-era light-touch framework." He has also proposed to stop treating wireless carriers the same as cable providers. Pai has argued that the 2015 rules have slowed the telecom industry's investment in building out broadband access and introducing innovative products, and specifically weighed on smaller Internet providers. For the past few weeks, both supporters and critics of Pai's repeal plan have produced research making the economic case both for and against strict net neutrality rules. The dissenting Democratic commissioner, Mignon Clyburn, "vociferously" opposed Pai's proposal, calling it "no-touch" rather than light-touch. "If you unequivocally trust that your broadband provider will always put the public interest over self-interest or the interest of their stockholders, then the 'Destroying Internet Freedom' [proposal] is for you," she said. For the next 90 days, the FCC will collect comments from stakeholders and the general public before drafting a specific order and voting on whether to set it into law. During the 2015 effort to the write the net neutrality rules, more than 4 million comments poured into the agency, most of them in support of strict regulations. HBO late-night host John Oliver has driven much attention to the issue. Pai and his Republican colleague, Commissioner Mike O'Rielly, said the new review of net neutrality will include a cost-benefit analysis, which they say wasn't done in 2015. Addressing reports of bots in the commenting system, Pai urged commenters to participate in an "honest and forthright way." "Thankfully, our rulemaking proceeding is not decided like a Dancing With The Stars contest, since counts of comments submitted have only so much value," O'Rielly said, adding: "Instead of operating in economics-free zone where the benefits of the rules are assumed to outweigh any cost, commenters will need to provide evidence to support their arguments that the rules are or are not needed." "Republican lawmakers have proposed converting the FCC regulation into a bill of some form, but Democrats — concerned that the results could be much weaker than the current rules — appear unmoved. They are currently gearing up for a grassroots battle similar to the kind that defeated the House Republican health care plan." Groups representing the telecom and cable industries have voiced support of Pai's push to repeal the 2015 regulations, though they assert support for an open Internet. The Internet Association, whose members include major web companies such as Amazon and Netflix, said it opposes "any changes to FCC regulations governing net neutrality." As with all previous attempts to set net neutrality rules, any final regulations that the FCC adopts under Pai are widely expected to be challenged in court.